Today at IFA in Berlin, Germany, ASUS held a press conference to cover a variety of new products. One of the more exciting products is the new Transformer tablet. We knew it was coming, and we’ve discussed a few of the specs in the past, but we finally have an official name: the ASUS Transformer Pad TF701T. As discussed previously, the TF701T will sport a 10.1” 2560x1600 IPS display. Powering the new Transformer is an NVIDIA Tegra 4 T40X quad-core SoC, which has four Cortex-A15 cores running at up to 1.9GHz and a 72-core GeForce GPU – the same SoC used in NVIDIA’s SHIELD. The new Transformer will initially launch in two models, both with 2GB DDR3L RAM: one has 32GB onboard storage and one has 64GB onboard storage (and both with microSDXC slots). Dual-band WiFi and Bluetooth 3.0 are included, and Miracast WiFi video streaming is also supported; the included HDMI connection can even drive a 4K display (presumably at 24p). Cameras are the usual, consisting of a 1.2MP front-facing camera and a 5MP rear-facing camera that can also shoot 1080p video. Besides the above features, the TF701T naturally continues the Transformer heritage and includes a keyboard dock that extends battery life and includes a USB 3.0 port and an SDXC slot. With tablet SoCs making rapid strides in performance, not to mention the quality of the displays, the use cases are ever expanding. 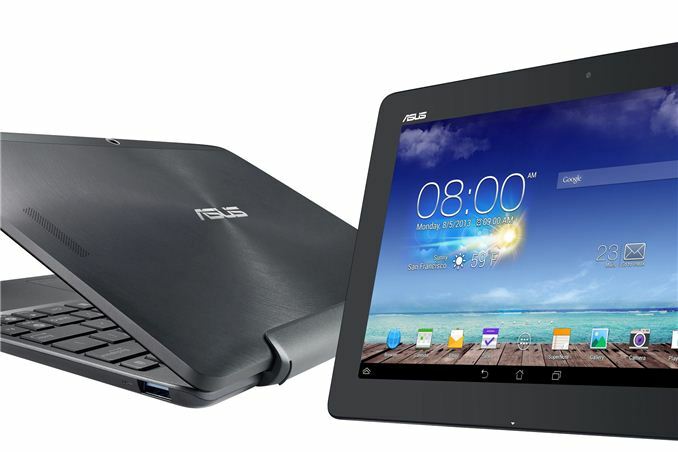 At the time the original ASUS Transformer launched, we felt it was an interesting idea but performance and the app ecosystem wasn’t enough for most people to replace their regular Windows laptop. Fast forward a couple years and such a thing is definitely possible. Android 4.2 is a big improvement from the old Honeycomb days, build quality is improved, battery life is also better, and performance should be 4x (perhaps even more) what we had just two years ago. Rounding out the features and specs, the tablet comes with a 31Wh battery rated at up to 13 hours battery life, while the dock has a 16Wh battery that can add up to 4 hours of battery life. The tablet measures 263mm x 180xmm x 8.9mm and weights 585g, and the dock is 263mm x 180.8mm x 7mm and weighs 570g. ASUS hasn’t finalized pricing or availability yet, but we should have that information in the next month or two. Such a colossal failure on MS's part that a device like this seemingly tailor-made to work with the concept of what was supposed to make Windows RT great will not include RT. I disagree, I think the TF series has more potential if Chrome OS and Android were more unified. I enjoy the TF700t as a tablet, but what hinders the "laptop" experience for me is the lack of floating browsers... which Chrome has.